When things go horribly wrong with the world around you, how can you keep trusting in God's goodness? Chad Veach offers no pat answers, but draws from the Bible and his own experience to reveal simple, purposeful steps for dealing with painful emotions and holding onto hope. "Where was God when ____? How could God allow ____? Why?" These are the questions that flood our hearts and minds when the unimaginable happens. When things go horribly wrong and the world seems to be unraveling, how do you believe in God's goodness? How do you cling to hope? Chad Veach directs readers away from cliché Sunday-School answers that fail to offer real comfort or faith-building insights. Instead, he draws revelation from God's promises in the Bible and from his own story of his daughter's diagnosis of a devastating and debilitating disease to reveal simple, purposeful steps for dealing with pain: get the rest needed to walk in grace; guard against letting a single day's emotions change how we understand God; remember God's past faithfulness to build expectation for the future; see the distinction between having faith and having hope; and many others. Veach reminds us that because we know who God is, we know there is hope. And even though the pain is real, so is the remedy. Since 2014, Chad Veach has been the pastor of Zoe Church in Los Angeles, California. Prior to this, he was on staff at Judah Smith's The City Church in Seattle, Washington. Chad has been described as a 'hipster pastor', and is in demand as a speaker at churches and conferences across the US. He has a particular expertise in youth ministry, and has much insight into how Christians 'do church' in different contexts. Chad and his wife, Julia, have three beautiful children, Georgia, Winston, and Maverick. 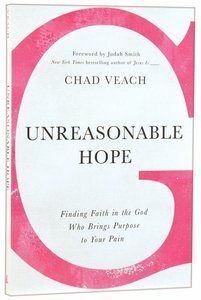 Georgia is diagnosed with lissencephaly, which has been a major motivation in the writing of Chad's book Unreasonable Hope. Customer Reviews For "Unreasonable Hope"
This book describes how to always have hope when life is not easy and smooth. Real life story of Pastor Chad and his family with real life struggle and great sense of humour that can teach us what to do when life gets tough and how to keep trusting and following God in the mid of suffering. Great great book.